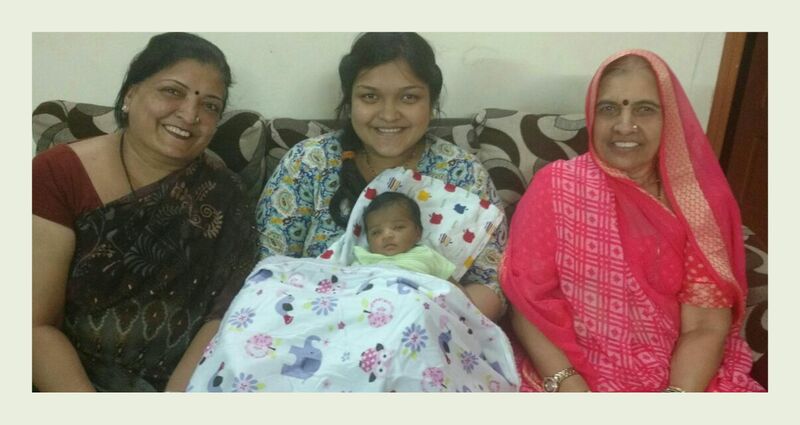 Growing up, I revelled in the ‘laad’ that my Nana and Nani showered upon me. I was the eldest grandchild on my mother’s side and that sort of led me into believing I was a privileged child. So I shamelessly asked things when I wanted them and sometimes I was spoilt for choice. Little #BabyHashtag too has the gift of being the oldest and the only grandchild. She has her Nanimaa, my mother and her Nanu and Cheeni (my uncle and aunt) and other Nanajis and Nanijis to spoil her rotten. My father, who would have been her Nana if he were alive would have had the most fun showering her with gifts and love. I’ve always been told that grandparents’ love for their grandchildren is much more than that of the parents’ but I never deemed it possible. But today when I have a baby, I see both her sets of grandparents play with her, become little babies around her, promising her to get her anything she wants. Now that she is only 20 weeks old, she does not understand the prospects of having fun grandparents. But I can already see a future where the toddler #BabyHashtag runs to her grandparents for every goodie that mum and dad have refused to give her. That is the beauty of having a Nana-Nani and Dada-Dadi. I remember this one time I was a little older than 7 years old, I found something fancy in my Nani’s kitchen while I was there on vacation. I chimed shamelessly, “Nani ye mere ghar pe nahi hain, ye main le jau?” (Nani I don’t have this thing at home, can I take it?) Mum looked at me with disgust, others in the room laughed and Nani said ‘yes’ without even giving it a thought. Grandparents are selfless when it comes to their grandchildren and I have been extremely lucky to have been loved by them. I still love going to my Nana-Nani’s home and I try to make it there atleast once a year. If you, as a parent, are trying to keep your children away from their loving grandparents consciously, please don’t. They learn how to love boundlessly from them. When people say that babies are drawn to other babies and really old people, take that as a sign of how much they care for their grandparents.